The Church's conversations about LGBT issues typically have more to do with politics and membership logs than with the power of the gospel. We fight between political parties about marriage laws and between denominations about Scriptural interpretation. Everyone is afraid of what the world will come to if the other camp get's its way. The conversation is often driven by fear, in both liberal and conservative circles. But, perfect love casts out fear (1 John 4:18). 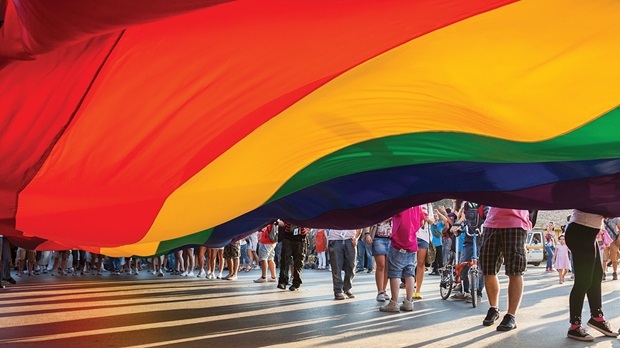 Peyton Jones has shared a powerful article about The Gospel in an LGBT World that brings the focus back on Jesus and the power of the Gospel. Most of us have become so accustom to death that we have no memory of what real life is like. We were born broken in a broken world. While our lives taste joy at moments, the presence of sickness, loss, and pain remind us that the world is not as it should be. Death reigns. Death in it's raw form is separation. A divorce is a kind of death as it is a separation of souls never meant to be pulled apart. A sickness is a kind of death, a separation from wholeness. Even physical death is a separation of the spirit from the body. Death was never to be a part of our world, and we know it. With every loss, with every ache, we grieve the loss of a world we never knew. Something has to change. Death came into the world through the act of one man. Adam was created in God's image to glorify God through relationship with Him (Genesis 1:26-28). Because God cannot be in relationship with sin, Adam separated us from God with one act of disobedience. This was the first death, spiritual death. Separation from God results in every kind of death. Through the millennia humans have perpetuated a cycle of sin and separation that has kept us separated from God and kept us in the presence of death. We were captives to sin and death, but God wants to set the captives free. Jesus came to restore humanity to God. He became human (John 1:14), lived a perfect life, and showed us true love in the form of sacrificial service. Ultimately, He took on the sin of humanity and died do pay the sin debt we all owed. Jesus died to make it possible for you to be restored to the relationship with God for which you were made. Everything you have ever done wrong was nailed to the cross with Jesus. He died that you might live. His substitution for you, His atoning death was the first step in the abolition of death, because it paid the debt that resulted in our separation from God. But, death could never hold the King of Glory. God raised Jesus from the dead (Romans 8:11, Mark 16:9). The Resurrection is not merely a nice story. Jesus really raised from the dead. His bones and flesh came alive, and he walked among his disciples alive (1 Corinthians 15:3-8). Next week, I'll share a chapter form my book, Follow: A Handbook for Making Disciples of Jesus Christ that gives some compelling evidence for the Resurrection. We celebrate the Resurrection (Easter Sunday), not just because we needed another Christian holiday, but because Jesus abolished death. When He rose from the dead, he began a process of restoration that is reversing the affects of sin on this world. If Adam's sin was a rock in a pond causing a ripple effect of death. Jesus' resurrection is a Rock in that same pond creating a ripple effect of life. Jesus is making all things new (Revelation 21:5). The world is still broken. The ripple effect of life is still making its way through the world. A day will come when all things are made new again. For now, let Jesus restore you. An April 5th, 2015 at 10:30am at 1110 Cooper Foster Park Road, Amherst, OH 44001 we will celebrate the Resurrection of Jesus Christ and it's reverberating effects on the abolition of death. Join us. In All Things New Tags Resurrection, easter, jesus, grave, risen, he is risen, death, life, salvation, restoration, Jesus is making all things new.